"PC replacements should pick up again in 2016, particularly later in the year." 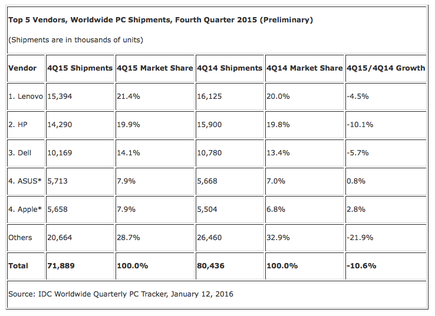 Worldwide PC shipments totalled 71.9 million units in the fourth quarter of 2015 (4Q15), a year-on-year decline of -10.6 per cent. Although total shipments - as reported by IDC - were in line with already conservative expectations, the news nonetheless ended 2015 as the first year below 300 million units since 2008. Unsurprisingly, findings show that the holiday quarter achieved a modest uptick compared to the third quarter, but the year-on-year decline in 2015 shipments was nevertheless the largest in history, surpassing the decline of -9.8 per cent in 2013. In truth, the PC market continued to face persistent challenges from longer PC life cycles and competition from mobile phones and tablets, despite the slowing growth in those markets. However, economic issues like falling commodity prices and weak international currencies, as well as social disruptions in EMEA and Asia/Pacific that disrupted foreign markets were a larger factor for 2015. Changes in the OS market also had a significant impact with the end of support for Windows XP and promotions of low-cost PCs driving a surge in replacements in 2014 that combined with the launch of Windows 10 and a free upgrade program to delay new system purchases in 2015. Lastly, while some very attractive new PCs have been launched, the market is taking some time to respond to new OS and hardware configurations - deciding when to upgrade and evaluating slim, convertible, detachable, and touch variations vs. more traditional PCs. “Nevertheless, many of these products have received positive reviews and there's potential for a faster commercial transition to Windows 10 in 2016 than we saw for prior versions of Windows,” says Loren Loverde , Vice President of Worldwide PC Tracker, IDC. Loverde says the PC market remains competitive and the economic environment weakened further with the recent drop in the Chinese stock market. “However, PC replacements should pick up again in 2016, particularly later in the year,” Loverde adds. “Commercial adoption of Windows 10 is expected to accelerate, and consumer buying should also stabilise by the second half of the year. Looking ahead, IDC believes that a majority of these users will purchase another PC, motivated by new products and attractive pricing. “Consumer sentiment toward PCs remains a challenge, though clearly there are pockets of growth,” adds Jay Chou, Research Manager of Worldwide PC Tracker, IDC. Detachable tablets, which are counted separately from PCs, are growing quickly but from a small base. Adding those units to PC shipments would boost growth by roughly six percentage points in the fourth quarter and three percentage points for all of 2015, bringing year-on-year growth for 4Q15 to a decline of about -5 per cent and -7.5 per cent for all of 2015. The impact for 2016 will be larger as detachable tablet volume grows, boosting earlier forecasts of PC growth in 2016 from -3.1 per cent to growth of 1 to 2 per cent. “The U.S. PC market fell -4.3 per cent year over year to 17.4 million units,” adds Linn Huang, Research Director, Devices & Displays, IDC. “Although the US dollar has been strengthening in lieu of currency crises in other regions, consumers here are not immune to economic concerns that have persisted globally. “The free upgrade path to Windows 10 allowed some consumers who might otherwise have shopped for new PCs during the holiday season to obtain a 'new' PC experience. 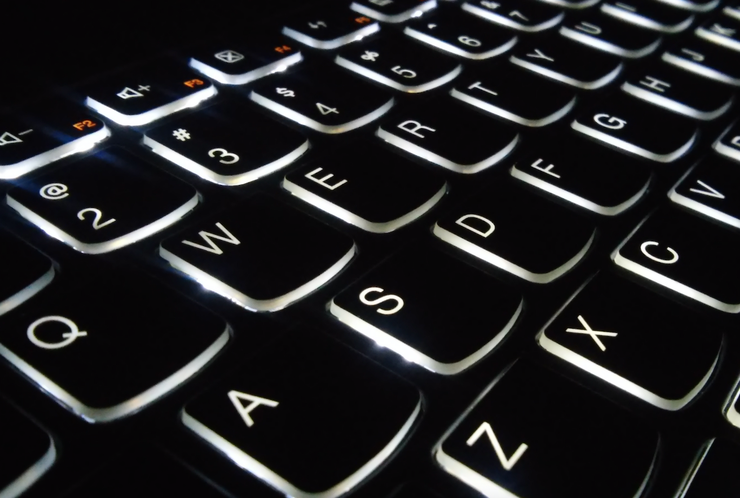 The Asia/Pacific PC market posted a year-on-year decline with shipments affected by weak consumer demand and high inventory levels in the channels. Currency fluctuations contributed to an increase in pricing and effectively softer sales, while end users continued to focus their spending on other consumer devices. IDC reports that the market was particularly soft in India, where floods and weak demand during festival season contributed to low sales of PCs in the consumer space. Lenovo maintained its top rank for the quarter and all of 2015, exceeding 20 percent market share for the year - shipments reached nearly 15.4 million units in the fourth quarter, mostly due to strong volume in North America. Meanwhile, IDC reports that HP was the number two vendor, slightly outperforming the market although its volume declined across regions. Dell remained the number three vendor at nearly 10.2 million units with above-market performance in the U.S.
ASUS outperformed the market and moved into the number four position, according to IDC, and with nearly 6 million units and 7.9 percent market share, this was the best quarter for ASUS since 2012 - strong sales in Asia/Pacific boosted the growth. IDC claims that Apple “effectively tied” ASUS for the number four position in the fourth quarter, but was clearly ahead on an annual basis. The company continued its strong run and outperformed the market, increasing its share globally to 7.9 percent for the quarter and 7.5 percent for the year.